Be at your customer's fingertips 24/7! Order your valuable PRINT copy today for only $45. Click here. Here's your chance to get BOLD with your business! 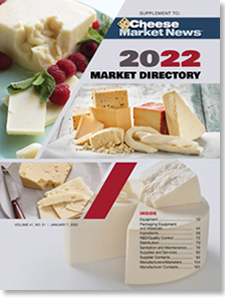 Increase your web traffic and sales with enhanced services from CHEESE MARKET NEWS. Get noticed first! Your opportunity to make your company information stand out from the rest. Boldface upgrade applies to both print and online listing. Click here to order. Instant access to your company's products and services. Offers industry professionals and prospects an opportunity to visit your website. Click here to order. Instant recognition of your company's listing in the contact section by prominently displaying your logo above your company's name. Traffic Stoppers apply to both print and online listings. Click here to order. Describe your company's services using up to 100 words. Help both current and potential customers understand your company's strengths and offerings in the marketplace to help increase sales. Company descriptions apply only to online listings. Click here to order. Help promote instant recognition for your company and drive traffic to your website. This is your opportunity to make your company stand out from the competition to help improve your bottom line. You have your choice of jpeg, animated or static GIF or Flash file formats. Requirements are 300 pixels in width by 250 pixels in height. Flash file sizes may not exceed 200 kb and a static JPEG should be supplied for site visitors who do not have Flash Player installed. This applies to online listings only. Click here to order.